Algebra and Coalgebra in Computer Science. In cooperation with ACM SIGLOG. The proceedings of CALCO 2015 have been published as part of the open-access Dagstuhl LIPIcs series and are available here. CALCO aims to bring together researchers and practitioners with interests in foundational aspects, and both traditional and emerging uses of algebra and coalgebra in computer science. 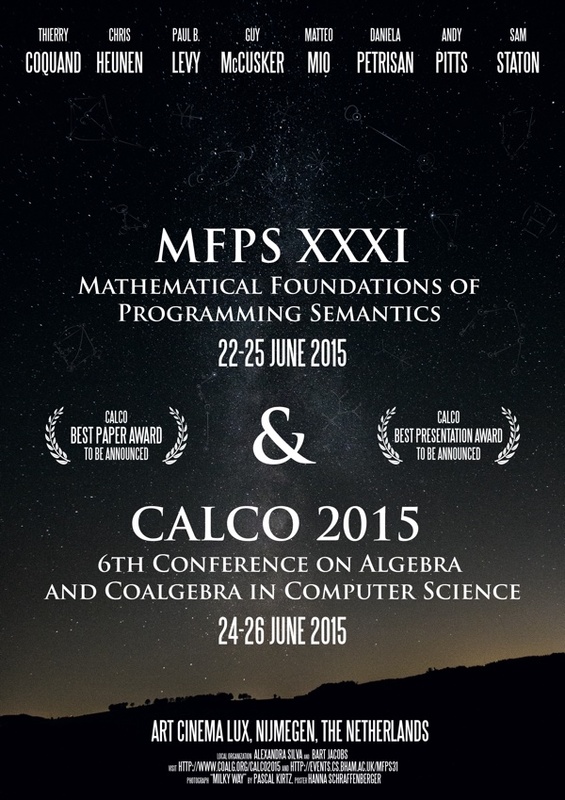 It is a high-level, bi-annual conference formed by joining the forces and reputations of CMCS (the International Workshop on Coalgebraic Methods in Computer Science), and WADT (the Workshop on Algebraic Development Techniques). Previous CALCO editions took place in Swansea (Wales, 2005), Bergen (Norway, 2007), Udine (Italy, 2009), Winchester (UK, 2011) and Warsaw (Poland, 2013). The sixth edition will be held in Nijmegen, the Netherlands. Nijmegen is the oldest city in the Netherlands and celebrated its 2,000th year of existence in 2005. It is situated in the eastern province of Gelderland, quite near to the German border. The latin name for Nijmegen, ‘Noviomagus’, is a reminder of its Roman past. ‘Noviomagus’ means ‘new market’ and refers to the right to hold a market as granted by the Romans. In the days of Charlemagne, the city was called ‘Numaga’; later on, this became ‘Nieumeghen’ and ‘Nimmegen’. However, citizens born and bred in Nijmegen speak affectionately of ‘Nimwegen’. Nijmegen is one of the warmest cities of the Netherlands, especially during summer, when the highest temperatures in the country are usually measured in the triangle Roermond – Nijmegen – Eindhoven. The lack of north-south oriented mountain ranges in Europe make this area prone to sudden shifts in weather, giving the region a semi-continental climate. The open exchange of ideas and the freedom of thought and expression are central to the values and goals of SIGLOG. They require an environment that recognizes the inherent worth of every person and group. They flourish in communities that foster mutual understanding and embrace diversity. For these reasons, SIGLOG is committed to providing a harassment-free conference experience, and implements the ACM policy against harassment. Conference participants violating these standards may be sanctioned or expelled from the meeting, at the discretion of the conference organizers. Conference organizers are requested to report serious incidents to the SIGLOG Chair.